Photograph 1 - Going through the Avenue of Giants (the big reds) south of Fortuna, California. 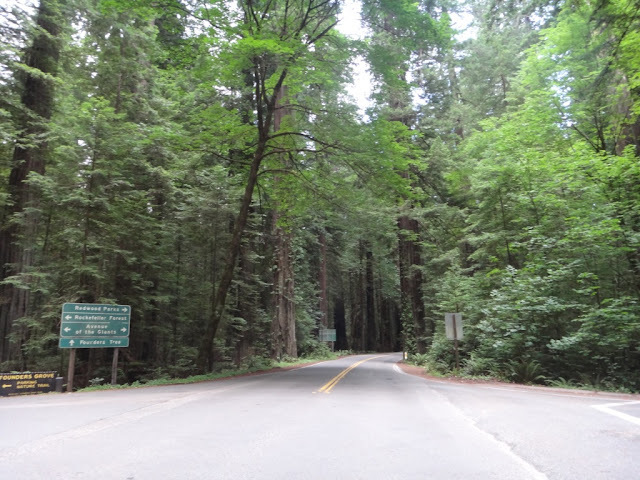 Photograph 2 - One of the many entrances into the Avenue of Giants, California. 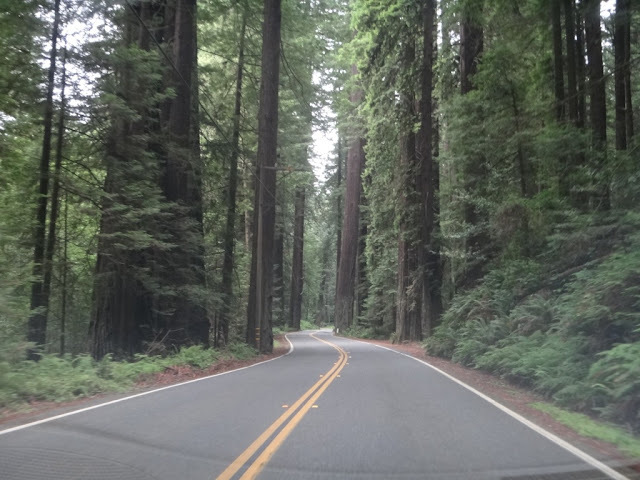 Photograph 3 - Redwoods and more redwoods. 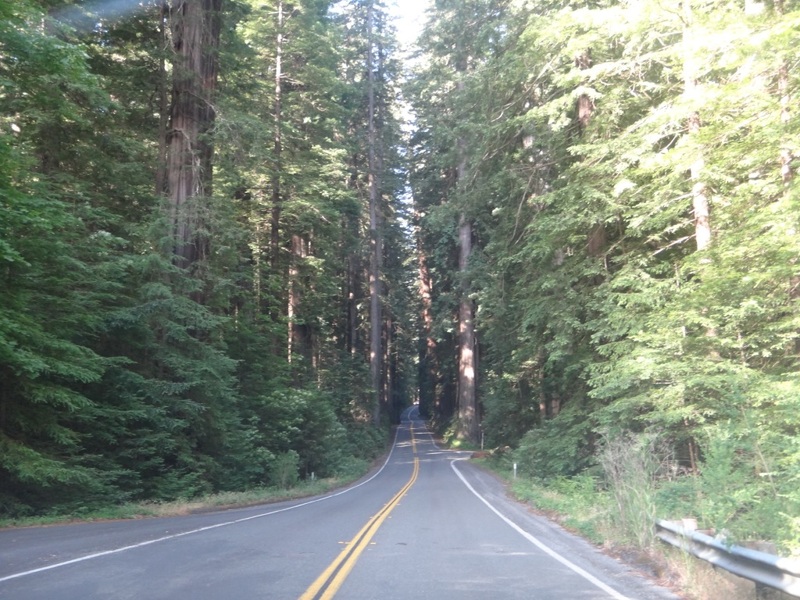 Apparently only 5% of redwoods are left since the start of logging back in 1850. 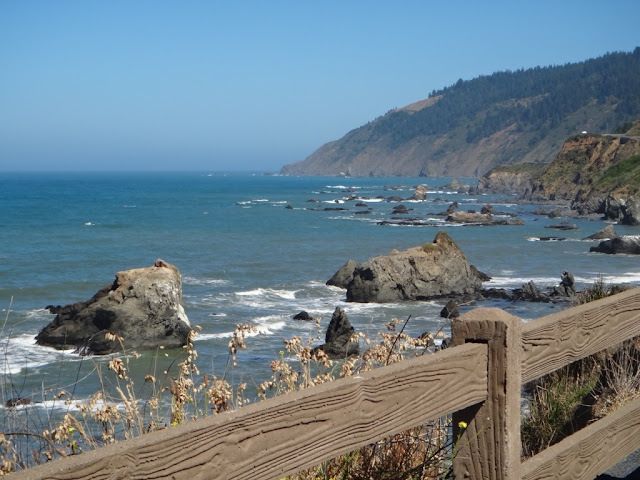 Photograph 4 - The rugged North Pacific coastline - not far from Fort Bragg, California. Photograph 5 - Fourth of July in California turned out to be a big frizzer. The wick was lit but no bang! 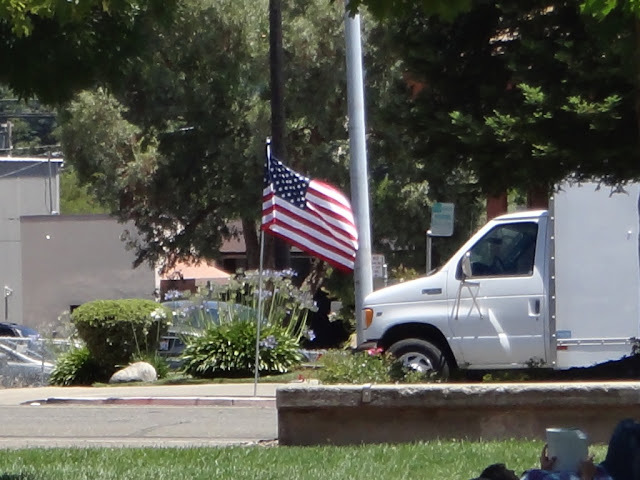 One of a few patriotic flags flying at Ukiah, California. Photograph 6 - Would you believe it...only five minutes before this picture was taken and a few miles to the north the sky was cloudless and clear. 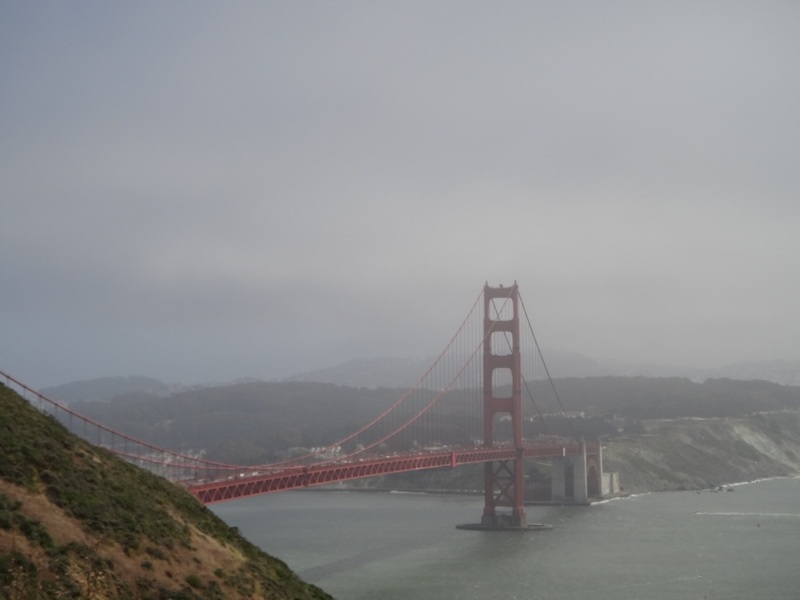 When we approach the Golden Gate there it was in fog! 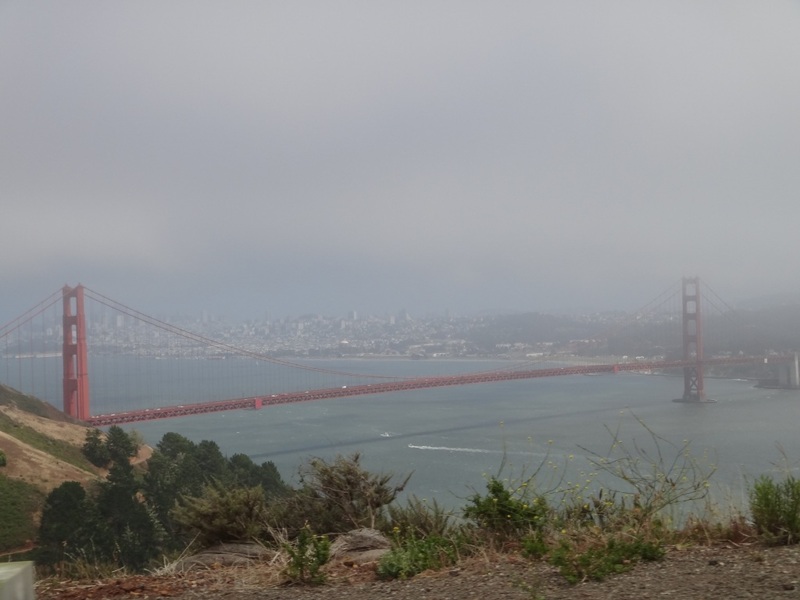 San Francisco is prone to fog cover in winter and in summer. The mist sneaks in from the sea at any unpredictable time of the day. Photograph 7 - Another picture of that famous bridge. 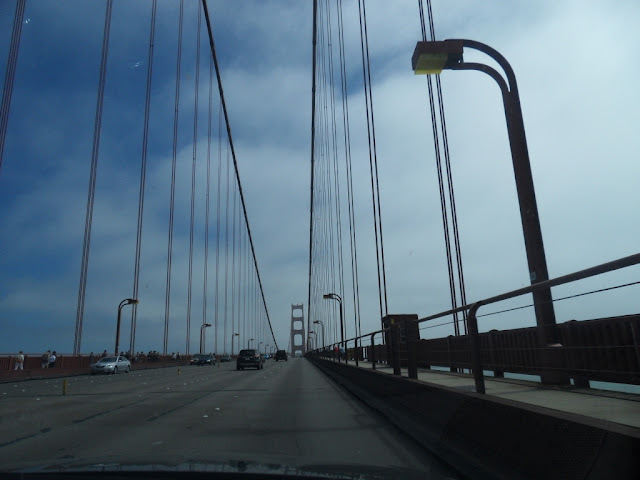 Photograph 8 - What an experience - crossing over that famous San Francisco icon. 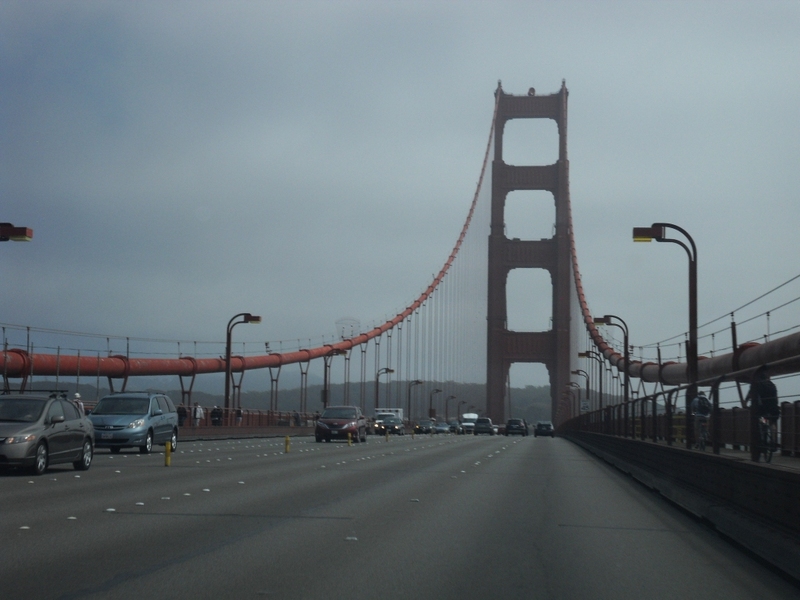 Photograph 9 - Approaching the southern pylon, golden Gate Bridge, San Francisco. 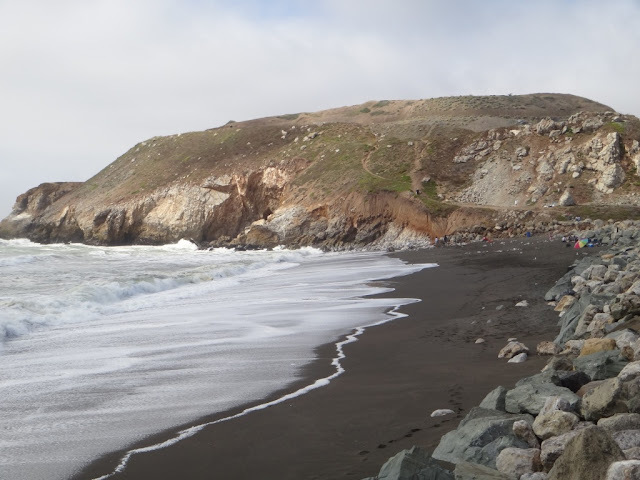 Photograph 10 - Rockaway Beach at Pacifica, near San Francisco. This is our view from our hotel window. It is the Fourth of July. We were expecting big things from the Californian folk to celebrate their Independence Day in an American boasting way - but no. All we have seen so far was some fireworks last night in Fortuna and some family sparklers along the beach in Pacifica. However, we heard that San Francisco is having some significant fireworks display tonight - but SF is about 19 miles away. The folks around here have just taken a day of from work, plant a few flags and relaxed - much the same as we celebrate Australia Day. Now for Anne. Anne's 42 hour birthday was driving through the Avenue of Giants (a 30 mil stretch of forest laden with redwoods), passing through Fort Bragg (on the coastline) and the highlight of the day was driving across the Golden Gate Bridge. When we approached the northern district of San Francisco and a few miles from the bridge all was great weather wise - clear skies and not much traffic. Well, driving over the last mountain and seeing the northern pylon for the first time we noticed it was in fog! Apparently there is not many days of the years Golden Gate shows its true spendour in completely clear weather. There is the prevailing fog that comes from the sea at any particular hour and remains over SF. Alas, we did see the bridge from its northern aspect and crossed over without too much fog. Our accommodation is at a location called Pacifica - right on the coastline and we discovered that it is directly on top of the San Andreas fault line. What are the chances of an earthquake whilst we are here??? When we checked in we were warned about how to deal with a quake if it happens. Also when Anne mentioned that it's her birthday and wallah we got an update. For dinner we had seafood dinners at two nearby restaurants - plus a couple of cocktails thrown in for good measure. Tomorrow we drive into San Francisco to Fisherman's Wharf for a seven hour tour of the city and an Alcatraz visit. Cheers.